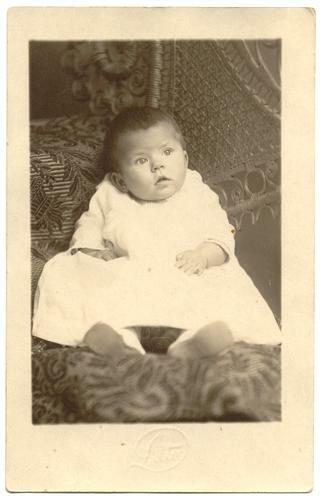 Infant wearing a gown and white shoes while sitting on an upholstered chair. "Baby Ruby" and "Aunt Mable and Uncle George" written on back. Location is unknown; photo was found with other items from southeast Nebraska and northeast Kansas. Real Photo postcard, ARTURA (1908-24). "Litto" embossed at bottom edge.